The South Asia Papers collects a lifetime of work and ideas. It roughly follows the trajectory of my career. I began as a historian and scholar working on military sociology, interested in caste in the Indian Army. Later my interests shifted, and my articles reflect that. I looked at how the Indian Army faced outward, that is foreign and strategic policy in general. In 1978 I co-authored a book, India: Emerging Power, which was my first major piece on Indian foreign policy. There were several diversions, including a year in Tokyo, when I couldn’t get an Indian visa. In Tokyo I spent a lot of time with their China experts, and got a different perspective on India, as seen from both Japan and China. 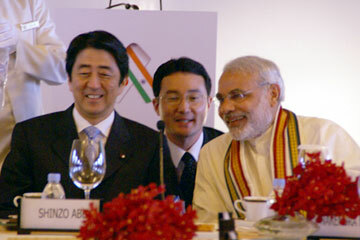 The Japanese often asked me: ‘Why are you bothering with India? It is not important.’ The Chinese had pretty much the same view. Social media companies such as Twitter need to do more to keep terrorists from using their platforms as digital mouthpieces and that means prioritizing national security matters over some users' privacy concerns. Islamic State and its supporters are managing the most aggressive and effective online recruitment and incitement campaign of any terrorist group in history. This situation highlights a monumental intelligence failure. Indeed, it's stunning to consider there's no clear policy that could contain the online influence capacity of a terrorist group striving to show it is a more competent nemesis to the US and its allies than al Qaeda. Nowhere is this failure more evident than on social media. Islamic State members have converted social media platforms managed by American companies like Twitter into cyber sanctuaries, from which the terrorist group amplifies narratives engineered to stimulate plots to kill Americans and our allies. As the terrorism caseload managed by the FBI suggests the Islamic State is accelerating the radicalization process that culminates in violence, it’s time to get more serious about denying terrorists access to these tools. According to the US National Counterterrorism Center, Islamic State militants demonstrate a "particular affinity for Twitter." On Twitter, propagandists, recruiters, and supporters use thousands of accounts to build and reinforce support for the group. Even though Twitter has suspended many Islamic State-linked accounts, its global network of devotees is undeterred. Taiwan has been in a political controversy ever since the Chinese civil war, which instigated a series of disputes between the Republic of China and the People’s Republic of China. Today this controversy continues without making headlines, at times and mostly without foreign interference. Their participation in the international arena became controversial until UN reached to a conclusion which resulted in a round table discussion in 1971 where PRC remained a legitimate contender. Since then, Taiwan has never participated in an international dialogue. The giant in electronics, Taiwan is famous for its good food, with a flourishing economyand with a population of over 23.3 million. Taiwan was a Japanese colony till the 2nd World War. With decisive victory over Japan, the island was under the occupation of US troops for a brief period, but as the Chinese Civil War grew intense, the Chinese nationalistsfailed to prevent communist’s aggression which led to the foundation of the People`s Republic of China in Beijing. Moreover, the Kuomintang, which were the political party of Chinese nationalists,under their leader Chiang Kai-shek,fearing execution, ran to Taiwanwhich they then referred as thecapital of the then Republic of China. Their hope and aspirations were to stand as an alternative government that would be more favourable to the Western rather than the communist government in Beijing. Afterwards, both governments pursued the ‘One China Policy’ and claimed to be the only legitimate representative of it. Technological advances have brought impressive improvements in rotorcraft technology albeit without eliminating the intrinsic limitations. The classic helicopter design has been mutated into newer types of rotorcraft or hybrid VTOL ones. 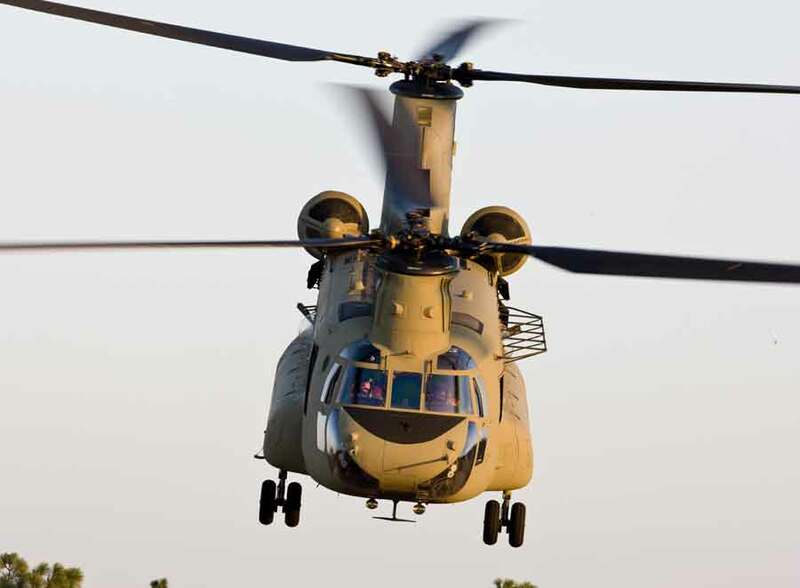 Nonetheless, the majority of helicopters retain the original tadpole-like shape with a main rotor and a tail rotor. Designers all over the world are persistently and continually seeking breakthroughs to achieve incremental performance parameters. Advances in high technology regimes continue to provide slow but steady support. The term ‘pecking order’, so visibly manifest in chickens, supposedly owes its origin to the Red Jungle Fowl of Thailand that evolved it as an aid to survival. It ensured that, when limited food was available, there were no fights over food which could attract attention of predators to the flock. In the technological marvels of the 20th century, fowl created from metals and alloys have displayed a similar, apparent ‘social’ demeanour wherein resources have been served up to the stronger of the flying machines. Thus, fixed wing combat aircraft with higher speeds and offensive roles have usurped a slot higher in the pecking order than slower, less potent, ground hugging ones, the helicopters. Bangladesh and Myanmar share about 271 kilometres of land border, of which around 150 kilometres lie in hilly areas, as well as a maritime border. In the past, their relationship has been marked by tensions due to border disputes and dispute over the migration of Rohingya refugees to Bangladesh. On occasion, these have even led to armed skirmishes between their border guards. A major standoff had also emerged when Myanmar tried to conduct exploration activities in the formerly disputed Exclusive Economic Zone (EEZs) and Bangladesh responded by sending three naval vessels. Although the dispute over the maritime border demarcation was resolved through international arbitration, the chill in the bilateral relationship had persisted. But the coming to power of a democratic government in Myanmar has significantly altered the political situation within that country and has also provided an opportunity to improve bilateral relations with Bangladesh. In the past, especially after the 1962 coup, successive military-led governments in Myanmar were driven by narrow national sentiments. They emphasised upon military solutions to, rather than political resolutions of, bilateral problems with neighbouring countries. This situation has somewhat changed after the November 2015 elections, which resulted in a landslide victory for the National League of Democracy (NLD) led by Aung San Suu Kyi. Now, Myanmar has a new president in Htin Kyaw, who is also the first elected civilian leader in more than 50 years. He took charge from Thein Sein who had introduced wide-ranging reforms. Suu Kyi could not become president because of constitutional restrictions that prohibit citizens with a foreign spouse and/or children from holding the high office. Instead, she has taken charge of the foreign ministry, though most people consider her as the de-facto president. IRCTC may or may not have been hacked; the railways doesn’t need to tell you about it because there are no mandatory disclosure laws in India. Indian Railways (IR) has other portals for ticket reservations, IRCTC is just one of the major public-facing portals. Most of these railway portals are still running on unsecured protocols, they don’t use any sort of security certificates yet and thus fall prey for hackers easily. It is no secret that the railways has bugs in their portals, the infamous bug of captcha being text is always laughed about in quora and reddit threads. If you are a railway fan and are familiar with the Indian Railway Fan Club Association, you would know how the moderators had to block people posting internal data from Integrated Coaching Management System, an internal portal of the railways. OTAs (Online Travel Aggregators) exploit several security bugs and hit railway servers constantly, data mining thousands of data records. Some even decrypt encrypted content in violation of the IT Act. They are even monetizing real-time railway data against the limited permissions to use them. You can’t possess any railway property illegally according to the RAILWAYS PROPERTY (Unlawful Possession) Act 1966; it follows that railway data is its property too. Right now data like train status, PNR status, ticket availability would fall under the public data. But OTAs accessing it using exploits in code make the data illegal, irrespective of it being public already. These practices of OTAs could prove potent at a time of disaster. Given the Pakistani obsession with matching India weapon for weapon, it is likely Islamabad will try and develop a Made in Pakistan BMD. At the same time, it will attempt to buy systems from outside as a hedge against failure. Considering the economic disparities between India and Pakistan, there’s no way Pakistan can match India missile for missile. Overspending on defence could well bankrupt Pakistan. India’s claim that its indigenously designed ballistic missile defence (BMD) system – successfully tested on May 15 – can defend the country from a nuclear attack is being contested by a Russian expert. According to Petr Topychkanov, Associate at the Carnegie Moscow Centre’s Non-Proliferation Programme, despite heavy investments in developing BMD systems, India may not be able to fully defend itself in a conflict from strikes by Pakistani missiles. “Even in 10 years and with the huge budgets that India plans to spend on the development of nuclear weapons and capabilities, it is difficult to imagine it will be able to defend its territory from possible strikes from Pakistan in case of conflict,” he says. Topychkanov’s observation isn’t wrong. Although India is now only the fourth country after Russia, Israel and the US to successfully test a BMD system, it is currently taking baby steps in ballistic missile development. BMD technologies are complicated and it will take years – and perhaps decades –before India gets a reliable system. After eight years of relative calm in the Taiwan Strait, Taiwan turned a page in its history on May 20, when Tsai Ing-wen of the Taiwan-centric Democratic Progressive Party was sworn in as president. While it may be premature to argue that the cross-Strait relationship has now entered a new, and possibly more conflict-prone, era under Tsai, we must nevertheless keep in mind that the military option to impose unification was never obviated by Beijing, and that as its power grows that option may look increasingly inevitable. Therefore, as the Tsai administration performs the onerous act of balancing between stability in the Taiwan Strait and meeting the expectations of its China-wary citizens, it must continue to prepare against the eventuality that China could resort to force of arms to break the status quo. Although not exhaustive, the following discussion looks at a number of areas that will be key to Taiwan’s ability to defend itself against external aggression in the coming years. This article, moreover, takes it for granted that Taiwan has experienced and internalized a doctrinal transformation whereby victory in the military sense no longer implies the defeat, if not annihilation, of its opponent, but rather focuses primarily on countering limiting scenarios while strengthening its deterrent capability against more escalatory measures by its opponent. In other words, Taiwan realizes it could not possibly challenge the People’s Liberation Army symmetrically and expect to emerge victorious; instead, the main aim of its national defense strategy is—or should be—to ensure that Beijing does not resort to force in the first place. To do so, it will have to bolster its capabilities and preparedness in the following areas. Recent developments in Chinese ballistic missile and warhead technology indicate that China not only has a missile warhead that is maneuverable but can, when mounted on new, longer range missiles, can hit U.S. carriers or small land targets over 3,000 kilometers away. The various components of such a system began to surface over a decade ago. By 2010 the U.S. believed that China had a version of their DF-21 ballistic missile with a conventional warhead that could hit a moving American carrier at a distance of 1,500 kilometers. There was no proof that such a system actually existed in a workable form. But over the last few years the necessary pieces of this mystery weapon began show up in working condition. The latest threat is not just to carriers at sea but to major American bases in the Pacific, particularly Guam. This situation got serious in 2014 when China revealed (apparently by accident) the existence of the DF-26 IRBM (Intermediate Range Ballistic Missile.) This one had a range of 3,500 kilometers and was based on the earlier DF-21. There had been reports of such a missile since 2007 and the DF-26C appears to have entered service sometime after 2010. The DF-26C is notable because it has the range to hit American military bases on the Central Pacific island of Guam. Armed with a maneuverable conventional warhead a DF-26 could take out key American military installations on Guam if enough of them were used at the same time. That would overwhelm existing American anti-missile systems there. .
A Chinese navy submarine. China has been working on ballistic missile submarine technology for more than three decades. Sudan, once the largest country in Africa (until the emergence of South Sudan), has been the epicentre of ethnic and religious cleansing for decades. Sudan has been affected by many conflicts. 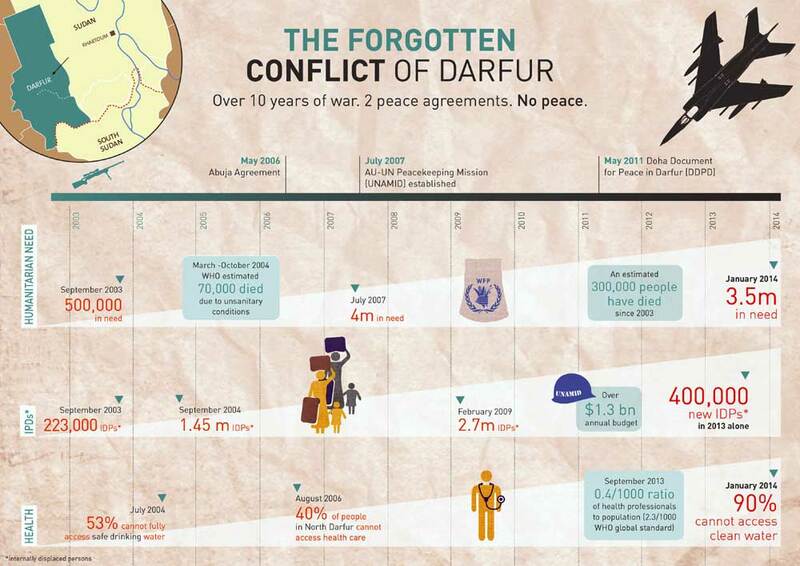 Clashes between the North and the South have taken more than a million lives, and the unceasing clashes and conflicts in Darfur (the Western region of Sudan), have left over millions internally and externally displaced, and further resulted in more than 200,000 casualties. 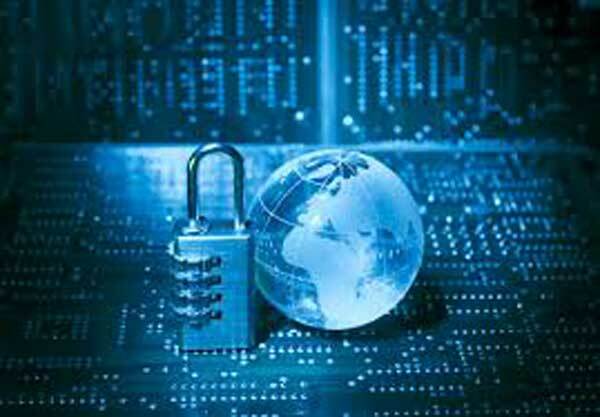 The cyber domain is becoming a key part of offensive operations for any group, be it a government, criminal organisation or terrorist group. The cyber domain provides the group with a low-cost means of harassing their enemies and publicising their cause. It has also proven to be attractive to ‘tech savvy’ youngsters. The Cyber Caliphate whose exact roots and origins are unclear but the devastating impact it is making is only matched by the brutality of ground operations of ISIS. Australia, 23 September 2014: An 18-year-old ISIS sympathiser was shot dead after stabbing two counter-terrorism officers outside a Melbourne police station. Canada, 22 October 2014: An Islamic convert killed a soldier at the National War Memorial in Ottawa, stormed Canada’s Parliament and fired multiple times before being killed. This has become the popular story of Masoud Barzani’s Kurdistan Regional Government that has circulated increasingly in Washington and London. According to this narrative, Iraq’s Kurds have been long oppressed, but instead of collapsing into internal conflict as many liberated societies in the region do, they have pressed ahead with democracy. As one Kurdish official recently noted, the Kurds remain steadfast as the West’s ally of choice against Islamic State (ISIS), patiently building relations with their neighbors despite a venal and corrupt government in Baghdad that sabotages every bid they make for financial independence. This narrative is more than a contentious historical interpretation—it is a PR invention. It was recently reported that the KRG spent almost $6 million lobbying in Washington since 2010, more than Pakistan has spent with its requests for subsidized F-16s and aid. Now that ISIS is weakening, while Baghdad remains broke, the KRG lobbying effort has reached fever pitch, with no fewer than three articles by officials in the Washington Post, Foreign Policy and Britain’s Guardian. Excerpt: The Iraqi Security Forces (ISF) and the Popular Mobilization launched a major operation on May 23 to recapture Fallujah from ISIS. Prime Minister Haidar al-Abadi announced Operation Breaking Terrorism late on May 22 following weeks of force build-up in the area. The ISF and Anbar Sunni tribal fighters carried out shaping operations to the south of Fallujah in the weeks prior, recapturing al-Salaam Junction and moving along the southern road on May 7. Iranian proxy Shi'a militias, including Kata'ib Hezbollah and Harakat al-Nujaba, deployed heavily to the vicinity of Fallujah beginning on May 17. Progress of the actual operation has been rapid, with the joint ISF-Popular Mobilization forces recapturing key locations within the first 24 hours. These included Garma sub-district, a small town northeast of Fallujah, and Naimiyah on the southern edge of Fallujah City on May 23. Even before ISIS, Sunni militants including Jaish al-Mujahideen, the 1920 Revolution Brigades, and Jaish Rijal al-Tariqa al-Naqshbandiyah (JRTN) used Garma as a support zone. As of May 26, security forces have captured much of the Garma area and have pressed on Fallujah’s northern, eastern, and southeastern flanks, though the progress of the ISF and Popular Mobilization in Albu Shajal and Saqlawiyah, on the northeastern axis, remains limited. 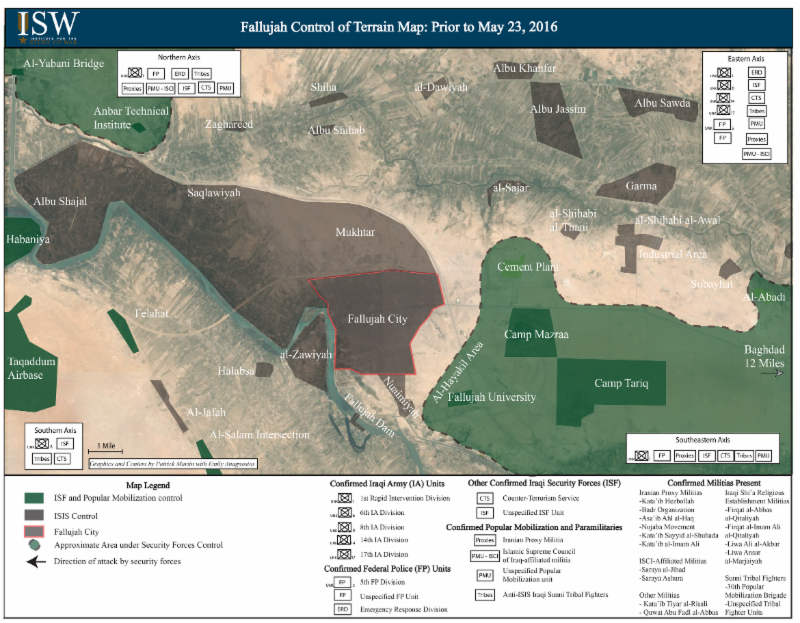 These areas need to be controlled in order to complete the encirclement of Fallujah. LONDON, May 27 (UPI) – Taxes and penalties issued by the Islamic State in the Middle East territories it controls show the group’s finances are dwindling, analysis finds. A report emailed from analysis group IHS finds revenue from taxes enforced by the Islamic State militant group are down 23 percent, forcing it to enact tighter policies and pursue steeper penalties of violations like possessing alcohol. “In the past six months, the Islamic State has introduced a range of new taxes and fines as a means of generating additional revenue from the population to compensate for the loss of oil revenue and from its shrinking territory,” Ludovico Carlino, a senior analyst with HIS, said in statement. More than two years ago, David S. Cohen, undersecretary for terrorism and financial intelligence at the Department of the Treasury, said financial pressure could diminish the Islamic State’s operational capacity in the region. The terrorist group is said to generate anywhere between several hundred thousand dollars to as much as $2 billion in illicit oil trade. The Islamic State, known also as Daesh, ISIS or ISIL, which once controlled large parts of Iraq and Syria, generates revenue by selling oil on the black market at a deep discount. THE KILLING OF MULLAH MANSOUR: MAJOR MILESTONE OR FART IN THE WIND? By affording a sanctuary to Taliban leaders in Pakistan, the United States has allowed the insurgent movement to grow in strength, to the point that they control nearly a third of Afghanistan. The U.S. drone strike that killed Mullah Mohammad Akhtar Mansour, the emir of the Taliban, could have been a good first step in altering a failing regional foreign policy. After all, a comprehensive campaign of targeting senior Taliban commanders, on both sides of the Afghanistan-Pakistan border, could serve as an effective counter to the insurgency’s growth. Unfortunately, President Obama has sent clear signals that this was probably a one-off attack and that he intends to stick to a tunnel vision approach of fostering political accommodation between the Afghan government and the Taliban. As a result, Mansour’s death will have a subdued impact on the insurgent movement – effectively a fart in the wind. The Taliban have already selected a successor: Malawi Haibatullah Akhunzada. Instead of driving them to the peace table, the Taliban will follow up Mansour’s death with an increase in attacks in Afghanistan in the near-term, similar to what we witnessed last summer when news of Mullah Omar’s death surfaced. Mullah Mansour's death does not inevitably translate into substantial weakening of the Taliban's operational capacity or a reprieve from what is shaping up to be a bloody summer in Afghanistan. Any fragmentation of the Taliban to come does not ipso facto imply stronger Afghan security forces or a reduction of violent conflict. Even if Mansour's demise eventually turns out to be an inflection point in the conflict and the Taliban does seriously fragment, such an outcome may only add complexity to the conflict. A lot of other factors, including crucially Afghan politics, influence the capacity of the Afghan security forces and their battlefield performance. Numerous Iranian media outlets reported May 25 that the website The Statistical Center of Iran was hacked and temporarily put out of use. News agencies wrote that the hackers were “outside of Iran” but little else was known about them. Some websites speculated that either the Islamic State (IS) or Iran’s regional rival Saudi Arabia conducted the attack. The low-level attack, which was followed by two attacks on Saudi Arabian statistical websites May 26, raised the question in Iranian media whether Saudi-Iranian cyber wars have begun. Summary⎙ Print After an Iranian website was hacked, some Iranian websites are speculating as to whether or not an Iranian-Saudi cyberwar has begun. In an articled headlined “The announcement of a cyberwar by Saudi Arabia against Iran?” Tabnak News agency wrote, “While many websites assumed this website was hacked by [IS] … it appears it is a Saudi hacker group.” Tabnak rejected the idea of IS involvement because the hackers referred to themselves as “Da۳s,” as in “Daesh,” an acronym the terrorist group does not use for itself. A Twitter account associated with Da۳s hackers followed a few well-known Saudi accounts, and Tabnak concluded that a Saudi group had conducted the attack with government backing. In any case, the screenshots provided of the hacked website appear to show that the hackers either wanted Iran to know that they were Saudi or that they intended to make it appear that they were. The threat facing Turkmenistan is less of a Color Revolution than an Unconventional War. The catalyst for this conflict would be a terrorist invasion coming from Afghanistan that unexpectedly sweeps northwards along the Murgab River. Such an offensive doesn’t even have to reach the national capital in order to be successful, since all that it really needs to do is capture the city of Mary, the capital of the resource-rich Mary Region. This part of the country contains the lion’s share of Turkmenistan’s gas reserve, which includes the massive and decades-long functioning Dauletabad Field and the newly discovered Galkynysh Field, the latter being the world’s second-largest find. It wouldn’t be all that difficult for terrorists to take over this plot of land either, since the Murgab River is scattered with tiny villages along its banks that could provide cover from government airstrikes and places to provoke pitched battles from. The fertile land nearby is endowed with agricultural potential that’s surely being stored somewhere closely accessible, and this could help feed the occupying forces until greater conquests are made. In short, the Murgab River is the most militarily and logistically sustainable route for an ISIL-like invasion of Turkmenistan, and it leads straight to the gas heart of Eurasia that’s critically connected to China and will possibly be linked to India in the coming decade as well. Canada is one of those countries where a vast land mass obscures the fact that the country has a relatively small population. While Canada is the second largest country in the world, its 35 million inhabitants make Canada only the 39th most populated country. In this way, Canada is similar to nations like Egypt, Russia and Australia – all of which are substantial in size yet their populations are clustered in small areas. This week’s map helps give a better sense of where people actually live in Canada. While Canada’s borders extend northwards all the way to Greenland, the Arctic and Alaska, the majority of the population lives in a fairly narrow band within 100 miles of the U.S. border. The most densely populated area is along this border in the east, extending from just east of Detroit to the Maritime Provinces on the coast, and containing the major cities of Toronto, Ottawa and Montreal. The second most densely populated region begins in Winnipeg and extends to the base of the Canadian Rockies. In between these two regions, however, Canada is sparsely populated. The explanation for this pattern is rooted in Canada’s unique geography. Arguably, Canada’s most crucial geographic feature is the Canadian Shield – an area formed mainly of volcanic rock covered with a thin layer of soil. 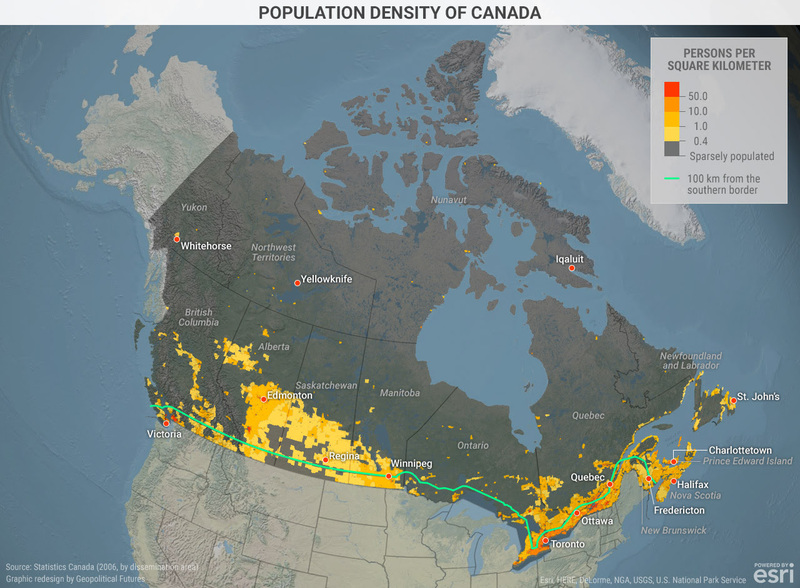 If you were to overlay a map of the Canadian Shield with this week’s population density map, you would see that Canada’s major population centers do not extend into the Shield. Much of Ontario is covered by the Shield, which explains the gap between the two main areas of dense population in the country. After a deep dive, oil prices are slowly crawling back up on the back of resurging demand from China and India in particular, as well as loomingsupply shortages from Nigeria to Venezuela. Yet oil markets are in for a rough ride, as uncertainties mount regarding oil’s continued predominance as transportation fuel in the coming decades. An accelerated adoption of electric vehicles would hasten the end of the oil era, and could cause significant geopolitical turbulence as producer countries heavily reliant on oil revenues will struggle to diversify their economies. We are already witnessing the destabilizing effects of low oil prices in the Middle East, while Russia’s aggressive behavior can also be partially explained by its domestic economic woes. At first glance, oil producers should not be too nervous. The International Energy Agency predicts that before the end of this decade, we should expect oil prices to rebound in the 80-plus-dollar range, as demand will continue to rise and new sources of supply will need to be brought to production to replace depleting ones. Around 40 million barrels per day of new crude production will be needed by 2030 to offset declines and meet new demand, according to the consultancy IHS. There is plenty of room for oil demand to grow in emerging economies. India only has seventeen passenger cars per 1,000 people, compared to 540 in Germany.